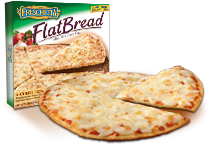 12" flatbread pizza by the Schwan Food Company. Flavors include 5-cheese, pepperoni, roasted garlic & spinach and zesty Italian. Mathew: Oh my God! I love this pizza. It's exactly perfect with its super thin and crispy crust, just the right amount of sauce and totally flavorful toppings. It cooks fast, like 8-10 minutes, it tastes great and its got way fewer calories and carbs than most frozen pizzas, so it's even good for you! Holy crap, I'm in frozen pizza heaven. What do you think, Helm? Helm: I think it strange that you are reviewing a pizza. And i think that you eat too much and are entirely too excited about a piece of frozen cardboard with cheese on it. Mathew: Dude, you're only saying that because you're just a helmet and you don't eat. This pizza is so awesome I would rather eat it than get pizza at a pizza joint. Helm: And I would rather you ate salad, or better still, launched yourself on a program of fasting until you brought your weight down to a level that would not embarrass a full grown hippo. Mathew: Always with the jabs about my weight. I'm hurt. Especially because this is like diet pizza. It's only 300 calories for 1/3rd of the pie! Helm: Which means little, considering you ate three whole pizzas just now. Mathew: I was hungry and I needed to fuel my body in order to battle the minions of evil. Helm: You could fuel an entire army with the victuals you tuck away. Mathew: Whatever. This is a great pizza. I'd rather have it for my magical talking friend than you. Helm: I am not your friend, and if you had a magical talking pizza, you would quickly lose your self control and eat it, rendering yourself a lazy slob with no redeeming magical artifact again. Mathew: Okay, you've got a point there. A pizza as good as this is meant to be eaten and enjoyed, not used to save the world. Although, given the low calories and such, this pizza may just save the world by being so darned healthy for people. Helm: You did not read the nutritional information panel, did you? Helm: Each serving contains a half a gram of Trans Fat. Mathew: WHAT?!? TRANS FAT?!? NO WAY!! Damn it!! !